Think about your community, the place you live and love. Now think about bringing that community high-quality pet care services with a heart and soul. With Dogtopia, you have the opportunity to provide your community of pet parents a safe, fun and stimulating environment for their pups. You can rest assured knowing you are delivering the highest quality of pet care to the community. Dog daycare is the “hero” of our business and is what sets us apart from other pet franchises. It is common for our customers to bring their dogs in for daycare at least 2-3 times per week, which provides the business with steady, recurring cash flow. Through daycare, we get to know our customers and their dogs personally, which leads to more frequent visits and a long-term relationship. 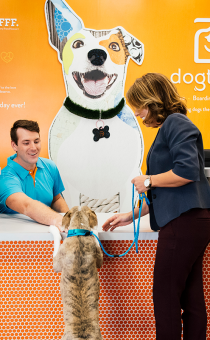 In contrast, a typical dog boarding or grooming business tends to have many “one-off” transactions which makes business planning, management and growth much more difficult. Dogtopia promotes safe socialization, exercise and education. 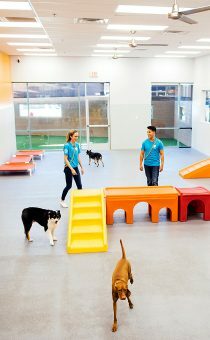 Our dogs enjoy an open-play environment with protective rubber flooring to ease the impact on our furry guests’ joints. Pet parents have the opportunity to purchase single day daycare visits, discounted multi-pack daycare passes and overnight boarding. Dogtopia’s fees are all-inclusive with meals prepared according to each pet parent’s request at no extra charge. We have recently launched subscription and membership-based daycare products which have proven very popular with our pet parents. These products provide for stable, reliable cash flow over an extended period of time. A dogtopia franchise might be the perfect business opportunity for you!